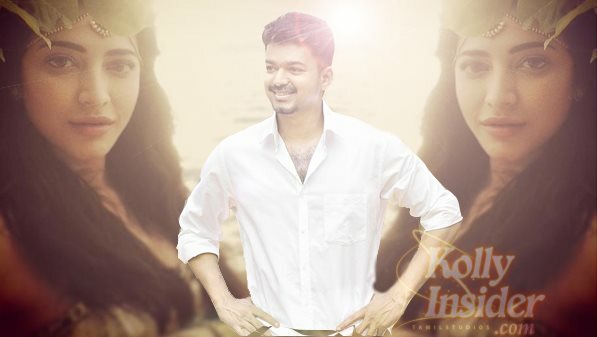 The first look of "Puli" was supposed to be released on 14 April, ie, on the Tamil New Year Day. But it has been postponed, leaving Vijay's fans disappointed. Days back, reports came in that Illayathalapathi Vijay’s ‘Puli’ directed by Chimbudevan will be releasing on the 17th of September on the auspicious Vinayaka Chathurthi holiday. Now here is another good news for Vijay fans, reliable sources tell us that the first look poster of the fantasy adventure film will be out on June 22nd the birthday of Vijay. The shooting of songs for "Puli" is currently going on at a brisk pace in some exotic locations of Thailand and Cambodia. Parallely, the VFX work of the movie is also taking place as the movie demands a lot of CG works. Earlier, Vijay's look in the movie as a warrior was leaked online and this had disturbed many including Vijay. It willl now be interesting to see which look of Vijay will be released in the first poster, as he is rumoured to play two different roles of an artist and a warrior. "Puli", written and directed by Chimbu Devan is touted to be an action fantasy thriller and is Vijay's costliest movie until now. The budget of the movie is said to have crossed over ₹118 Crore. The movie also has an impressive star cast of Prabhu, Sudeep, Sreedevi Kapoor, Vijayakumar, Thambi Ramaiah, Aadukalam Naren, Nanditha Swetha, Joe Malloori, Ajay Rathnam, Sathya, Karunas, Imman Annachi, Robo Shankar, Vidhyulekha Raman and Jasper.